Remember the scene in the movie Minority Report where Tom Cruise uses a 3D holographic interface to track down people before they commit crimes? True holographic projection technology is still years away from being a reality, but some Japanese scientists are at least headed in the right direction. It’s not exactly a hologram, but Japan’s National Institute of Advanced Industrial Science and Technology (AIST) has developed a 3D display that uses intersecting infrared lasers to create small amounts of plasma emission in mid air. 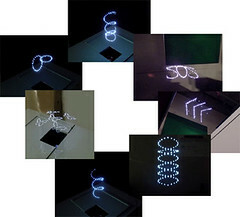 By controlling the position of the focal point in the x-, y-, and z-axes, the visible plasma dots are capable of forming letters and simple shapes in 3D-space. If you attended SIGGRAPH 2006 then you might have already seen this fancy laser projector on display. If not, here’s your chance. Check out the video clip. It’s probably only a matter of time until advertisers start utilizing this technology as a form of nighttime skywriting.